Watch Gov. Rendell's interview Wednesday. (CNN)-Governor Ed Rendell's name has recently come up as a potential running mate for Barack Obama, but the Pennsylvania Governor said Wednesday, why settle for a Clinton supporter when you can have the real deal. Rendell, who has encouraged the New York Senator to 'stay the course,' despite calls for her to end her campaign, said Wednesday she may not win the nomination - but should be on the ticket either way. "If Senator Obama becomes our nominee and he wants someone to carry the Clinton banner there's no question in my mind he should ask Hillary Clinton," Rendell told CNN's Kyra Phillips. A major rift remains among Democratic voters as exit polls continually show a large portion of Clinton's supporters will not support Obama if he is the nominee in November, and vice versa. Still, the Pennsylvania governor said he would help Obama in his state as he did Clinton. "If Hillary Clinton is not the nominee, I know that she cares very much about making change, and she will absolutely support Senator Obama enthusiastically," said Rendell. "But I believe with all my heart that she is the most experienced and most ready to be president." I don't want Gov. 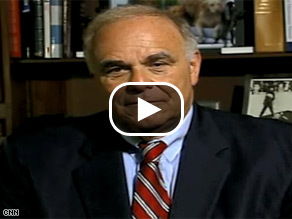 Rendell either, he's a very divisive man and he said "whites would never vote for a black man" with a twinkle in his eye. This man can not be trusted, and if PA wants a backwards governor, that's their business, don't push him on the national scene. He's clearly not ready for prime time, but I know there are some Klansmen who would love to have him as their leader. He should not at all. The idea of offering her the Vice Presidency as some sort of consolation prize for loosing a "hard fought" race is ridiculous. And outside of that, do people really think Hill/Bill would sit idly by, BELOW a former Jr. Senator, now as president? It wouldn't happen, and would be counter-productive. I also think it's ridiculous to think that Hillary is the only one with the keys to white, blue collar workers is ridiculous. When this is said and done, I think the best course for Hillary would be to finish her term in the senate, then run for Governor of New York. It tickles me when people, white people, blame blacks or voting for Obama. We are only 14% of the nations population. Only a small % even bothers to vote. If he got 100% of all the black votes you people still have us by 5 to 1. If Slick Hillie looses this it will be because White people voted him in. Not us. It seems like you are always looking for someone to blame.